On Thursday, February 27, four Society of Women Engineers (SWE) members traveled to Bellefonte Middle School to give an outreach presentation to half of the 6th grade class. Although the presentation was given to both male and female students, the event was scheduled to occur on National Introduce a Girl to Engineering Day, which is part of the week-long Engineers Week celebration. On Monday, March 2, three more SWE members returned to the school to give the same presentation to the other half of the class. The presentation began with an overview of what engineering is and the impact it has on the world. We also discussed the different disciplines of engineering, and shared our own personal engineering experiences. Finally, we talked about how they, as middle school students, can “test drive” engineering by going to STEM camps or job shadowing an engineer that they know. The presentation was very interactive, as the students already had a decent grasp on engineering, so they were very eager to answer our questions and even ask their own! The second part of the presentation included an interactive design activity. The purpose of the activity was to teach the students about aviation science and the engineering that goes into making a plane fly. The students were then given a chance to work in groups to create their own airplanes using different types of paper, paperclips, binder clips, and tape to see which group could design the plane that traveled the farthest. Before diving into the design activity, we gave a brief overview of the four main forces affecting the flight of an aircraft: thrust, lift, drag, and gravity. Nicki Gallegor, outreach director of SWE, says she was excited when the students understood these different properties and how to apply them to simple paper airplanes to make them fly. For example, they knew that for the case of their paper airplanes, thrust would be generated by the forward throwing motion of their hand, as opposed to a jet engine. When the groups of students were given their materials, there was slight chaos as they began the design process. However, when the time came to test the planes, the students were very cooperative and had a great time cheering on their classmates! The top two teams whose plane traveled the farthest, and the team with the most creative design, were given prizes. Nicki says her favorite part was when the students came together to take an epic selfie while holding up their creations. Outreach events like these are very important to SWE because we recognize that the only way to supply the world with future engineers is by getting students interested in engineering at an early age. Interactive presentations are a great way to do that, because students are able to see first-hand how cool engineering can be! Katie Ciccaglione is vice president of student relations for SWE. A native of Pittsburgh, PA, she will graduate this May with her bachelor’s degree in mechanical engineering. Katie plans to move to New Orleans to work as a well interventions engineer at Shell Oil Company. Nicki Gallegor is a mechanical engineering sophomore from Pittsburgh, PA. She will complete an internship at Rockwell Automation this summer. The Turner Prize: What Does Academic Collaboration Mean? That powerful quote was used by Karen Sweeney (’80 AE) to close out the 2014 Henry C. Turner Prize for Innovation in Construction event on Wednesday, December 3, 2014 at the National Building Museum in Washington, D.C.
Sweeney, Senior Vice President: Diversity, Inclusion and Community at Turner Construction, served as moderator of the panel discussion after the Penn State Department of Architectural Engineering was recognized for bringing together students, educators, researchers, government entities, and industry to build efficiencies in the building industry and encourage energy-efficient building solutions. The award committee specifically cited architectural engineering’s GridSTAR Center efforts at the Navy Yard in Philadelphia as one of the reasons for honoring Penn State with this year’s prize. Panelist Ted Lynch (’92 AE, ’96 PhD), president, Southland Industries, agreed that Penn State is willing to adapt to the needs of its partners. “Penn State architectural engineering is responsive to the needs of the design/build industry,” he said. One area of opportunity, Lynch said, is for industry and higher education to collaborate in the research areas that would help address the many issues and challenges facing the industry. “The traditional university system isn’t set up to encourage collaboration, or at least not without too much bureaucracy,” Grady said. “We have the freedom to establish programs like GridSTAR and engage students who are interested in these programs,” said Chimay Anumba, department head, Penn State Department of Architectural Engineering. Another panelist and former under-secretary at the United States Department of Education, Martha Kanter, said that other universities should look at Penn State architectural engineering’s track record of preparing students for success and scale it to help solve the nationwide issue of students being underprepared for the work force. 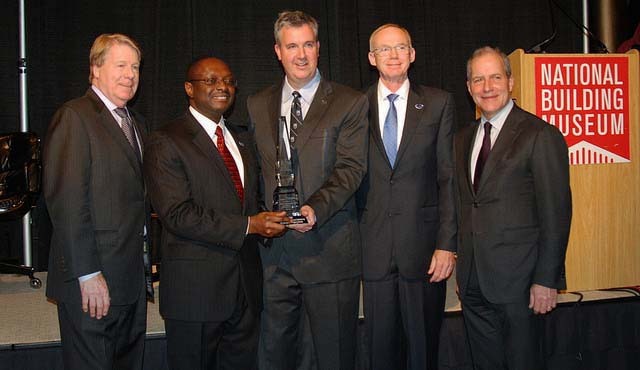 The presentation of the Turner Prize (l. to r.): Chase Rynd, executive director, National Building Museum; Chimay Anumba, department head, Penn State Department of Architectural Engineering; David Riley, professor of architectural engineering and director of the GridSTAR Center; Anthony Atchley, senior associate dean, Penn State College of Engineering; Peter J. Davoren, president and chief executive officer, Turner Construction. Karen Sweeney, left, moderates a conversation on innovation, education, and collaboration as driving forces in economic development and a 21st-century workforce. Panelists (L-R): Chimay Anumba, John Grady, Martha Kanter, and Ted Lynch.